—John Tomerlin, “Number Twelve Looks Just Like You,” 1964. 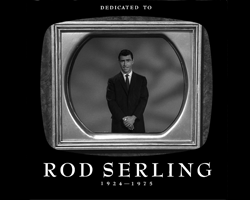 —Rod Serling, “Mr. Bevis,” 1960. The Twilight Zone is a legacy that continues to teach, entertain, and inspire; it is a measure of that legacy that Rod Serling was able to surmount the obstacles inherent in a commercial medium like television to touch more people's imaginations with more ideas of lasting impact than any American (television?) writer of our time. —George Clayton Johnson, “A Game of Pool,” 1961. “It’s a Good Life,” 1961; “From Agnes—with Love,” 1963; “Nick of Time,” 1960. New York Times crossword puzzle, circa 1990s; Postage stamp issued 2009; Chronicle Books, 1990.